Often pet owners worry about their cats gaining too much weight, but unintentional feline weight loss can be just as harmful to your cat's health. Unintentional weight loss in cats can lead to illnesses such as feline anemia and is usually a sign that your cat may be suffering from one of several cat health problems. Cats that are living in or going through a stressful situation such as moving, may also experience sudden weight loss. There are a many different causes of feline weight loss. The most common reasons for weight loss in cats include parasites, feline leukemia virus disease complex (FeLV), inflammatory bowel disease (IBC), liver disease, and diabetes. Parasites such as; ringworms, roundworms, tapeworms or giardia can cause vomiting and a lack of appetite. Parasites are treatable by using oral or topical medications recommended by your cat's veterinarian. To find out more about the causes and treatment methods for worms read how to treat worms in cats. The feline leukemia virus can cause symptoms such as enlarged lymph nodes, discoloration of your cat's tongue or nose, fever, depression, or difficulty breathing. This disease weakens your cat's immune system, leaving your cat more susceptible to other diseases and infections, these infections may cause your cat to feel ill resulting in loss of appetite and feline weight loss. Inflammatory bowel disease describes a group of gastrointestinal disorders which display as inflammation of the linning of the digestive tract. Symptoms include chronic diarrhea,vomiting and weight loss. Liver disease can be caused by a number of factors including cancer, hepatitis or increased toxicity in your cat’s body. The liver is responsible for filtering out toxins from the blood and aiding in digestion. Symptoms include vomiting, diarrhea and weight loss, but may also include seizures, bad breath and depression. Diabetes in cats is the result of their pancreas not creating enough insulin or not having any insulin to metabolizes the sugar in their blood. Symptoms of diabetes may include weight loss, vomiting, bad breath, excessive urination and thirst. Although there is no cure for diabetes, it is a manageable condition through diet and medication. Stress due to recent changes in location, health, etc. Once you notice a change in your cat's weight, it’s important to bring your cat to his/ her veterinarian for a physical examination. 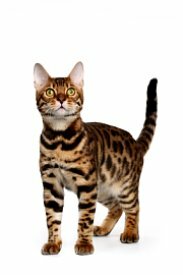 Your vet will discuss symptoms your cat may be experiencing, examine your cat's medical history, count T3 and T4 levels, complete blood count, biochemical profile, abdominal x-ray or ultrasound, urinalysis and tests to check for hyperthyroidism and diabetes. A veterinarian may recommend many different treatment options depending on your cat’s health and the cause of the weight loss. Anxiety and stress can be a major culprit for feline weight loss when no other health condition is present. A stressed cat may eat significantly less or completely avoid food altogether. After moving we noticed that our youngest cat was spending alot of her time under the bed, barely eating and looked like she was losing some weight. After taking her to the vets for a physical examination, just to make sure there wasn't a serious unlining health problem, our vet informed us that she was just a bit stressed out about the move. Cats are very different, our oldest just needed a day to sniff around the house and mark her territory and she was content, meanwhile it took our youngest about two weeks to feel comfortable. During stressful times such as; moving, a new pet, a new baby, your cat may need some extra attention to decrease the impact of a change. For health conditions like the most common listed earlier: parasites, feline leukemia virus disease complex (FeLV), inflammatory bowel disease (IBC), liver disease, and diabetes, treatment is specific to each individual case. For the treatment of parasites, your vet may prescribe or suggest an over the counter treatment, which are usually very effective in treating a parasite infestation. In order to treat feline leukemia, your vet may prescribe one of several drugs available including ImmunoRegulin, Acemannan, and Interferon Alpha. Treatment for inflammatory bowel disease includes finding the source of irritation in your cat’s diet and eliminating that particle brand of food or treats from their diet. The treatment of liver disease depends on the cause. It may include medication to reduce vomiting, IV administration of fluids and medications such as corticosteroids. Although diabetes cannot be cured, it can be managed through diet and medication. Unintentional feline weight loss is sometimes a red flag that something serious could be wrong. If you notice that your cat has been losing weight, it is essential that your cat be taken to the vets to make sure that the weight loss isn't a result of a serious underlying health condition.